For the South African fossil site, see Gondolin Cave. Gondolin is a fictional city in J. R. R. Tolkien's legendarium, inhabited by Elves. Founded with divine inspiration, it is hidden by mountains and endures for centuries before being betrayed and destroyed. It was the mightiest of the elven homes in the Hither Lands. The city was famed for its walls, and had possible parallels to Troy. The city is first described in The Fall of Gondolin which was the foundational completed tale for all of Tolkien's Middle-earth stories. The story was read aloud by Tolkien to the Exeter College Essay Club in the spring of 1920. Gondolin was founded by King Turgon in the First Age. It was originally named Ondolindë. According to The Silmarillion, the Vala Ulmo, the Lord of Waters, revealed the location of the Vale of Tumladen to Turgon in a dream. Under this divine guidance, Turgon travelled from his kingdom in Nevrast and found the vale. Within the Echoriath, the Encircling Mountains, lay a round level plain with sheer walls on all sides and a ravine and tunnel leading out to the southwest known as the Hidden Way. In the middle of the vale there was a steep hill which was called Amon Gwareth, the "Hill of Watch". There Turgon decided to found a city, designed after the city of Tirion in Valinor that the Noldor had left. Turgon and his people built Gondolin in secret. After it was completed, he took with him to dwell in the hidden city his entire people in Nevrast—almost a third of the Noldor of Fingolfin's House—as well as nearly three quarters of the northern Sindar. The Hidden Pass was protected by seven gates, all constantly guarded; the first of wood, then stone, bronze, iron, silver, gold, and steel, perhaps based on Herodotus's description of the Medean city of Ecbatana. The seven gates of Minas Tirith echoed this notion of a layered defence on a hill. The city stood for nearly 400 years until it was betrayed to Morgoth by Maeglin, Turgon's nephew. Maeglin was captured while mining outside the Encircling Mountains (against Turgon's orders). Maeglin betrayed the location of Gondolin after being promised Lordship and Turgon's daughter Idril. Morgoth then sent an army over the Crissaegrim, the northernmost precipitous and dangerous portion of the Encircling Mountains, during The Gates of Summer (a great Gondolin festival), catching them unawares and sacking the city with relative ease. 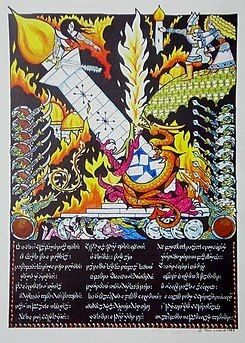 In addition to orcs, Balrogs and dragons, Melkor's (Morgoth's) army, in early versions of the story, included iron machines (tanks) powered by "internal fires" and used as personnel carriers, to surmount difficult geographic obstacles and to defeat fortifications. The Fall of Gondolin closely resembles that of Troy. According to "The Book of Lost Tales" the city had seven names: "’Tis said and ’tis sung: Gondobar am I called and Gondothlimbar, City of Stone and City of the Dwellers in Stone; Gondolin the Stone of Song and Gwarestrin am I named, the Tower of the Guard, Gar Thurion or the Secret Place, for I am hidden from the eyes of Melko; but they who love me most greatly call me Loth, for like a flower am I, even Lothengriol the flower that blooms on the plain." The folk of the White Wing Tuor "These wore wings as it were of swans or gulls upon their helms, and the emblem of the White Wing was upon their shields." The bodyguard of Tuor. The House of the Mole or the Thlim Doldrin Maeglin "Sable was their harness, and they bore no sign or emblem, but their round caps of steel were covered with moleskin." Composed of skilled miners. The House of the Swallow or the Thlim Duilin Duilin "[They] bore a fan of feathers on their helms, and they were arrayed in white and dark blue and in purple and black and showed an arrowhead on their shield." Gondolin's best archers. The House of the Heavenly Arch or the Thlim Quing Ilon Egalmoth "They were arrayed in a glory of colours, and their arms were set with jewels. Every shield of that battalion was of the blue of the heavens." A very wealthy house; comprised the other part of Gondolin's archers. The House of the Pillar or the Thlim Climbol Penlod unknown Their leader was slain during the Fall of Gondolin. The House of the Tower of Snow or the Thlim Ith Mindon Penlod unknown Their leader was slain during the Fall of Gondolin. The House of the Tree or the Thlim Galdon Galdor "Their raiment was green." Wielded clubs and slings. The House of the Golden Flower or the Thlim Losglóriol Glorfindel "[They] bore a golden flower upon their shield." The House of the Fountain or the Thlim Ecthel Ecthelion "Silver and diamonds was their delight ; and swords very long and bright and pale did they wield." The guard of the fountains, primarily those of the king. Warriors of this house defended the seventh gate of Gondolin. They marched into battle to the playing of flutes. The House of the Harp or the Thlim Salum Salgant "A harp of silver shone in their blazonry upon a field of black." House of musicians. However, their leader was a craven. The House of the Hammer of Wrath or the Thlim Gothodrum Rog "The sign of this people was the Stricken Anvil, and a hammer that smiteth sparks about it was set on their shields." The largest and most valiant house. They comprised those blacksmiths who were not under Maeglin, as well as escaped thralls of Morgoth. They perished to the last elf during the Fall of Gondolin. The House of the King King Turgon "The array of the house of the king and their colours were white and gold and red, and their emblems the moon and the sun and the scarlet heart [of Finwë Nólemë]." The three Royal Guard battalions of King Turgon. In the hidden city of Gondolin, an isolated land, a peculiar Elvish dialect developed: "This differed from the standard (of Doriath) (a) in having Western and some Northern elements, and (b) in incorporating a good many Noldorin-Quenya words in more or less Sindarized forms. Thus the city was usually called Gondolin (from Q. Ondolin(dë)) with simple replacement of g-, not Goenlin or Goenglin [as it would have been in standard Sindarin]". The common or standard Sindarin tongue was not used in Gondolin. The smiths of Gondolin, using Elven techniques and magics, made powerful magic blades. In The Hobbit, the swords Orcrist, Glamdring and a long dagger later named Sting were found in a Rhudaur Troll-Hoard. Each of these weapons had the ability to detect Goblins/Orcs in the immediate vicinity by glowing blue. They also had the property of striking fear in the hearts of Orcs when used against them in combat. All were well-crafted, and extraordinarily sharp. Apparently, Gondolinian weapons were impervious to rust and corrosion, as the examples found in the trolls' lair were over six thousand years old and had been hanging in the lair for an indeterminate length of time, yet were sharp and ready for use when unsheathed. The dagger Sting was known to have special powers against giant spiders (distant offspring of Ungoliant) and could cut their webs with ease. It also was highly effective against Shelob, cutting the spider's eyes and wounding her sufficiently that she fled in pain. Whether the longer Gondolin swords mentioned in Tolkien's works had similar powers versus spiders is unknown. Such creatures were common in the Ered Gorgoroth south of Gondolin. ^ "Tolkien explained its origin in his "Name-list to "The Fall of Gondolin" thus: "Gondolin meaneth in Gnomish 'stone of song' (whereby figuratively the Gnomes meant stone that was carven and wrought to great beauty)". Tolkien, J.R.R. The Book of Lost Tales, part II. p. 216. ^ Tolkien, J.R.R. Tolkien ; edited by Christopher (1981). The Silmarillion ([29.print.] ed.). New York: Ballantine Books. p. 287. ISBN 978-0-345-32581-5. ^ M., Bruce, Alexander (22 March 2012). "The Fall of Gondolin and the Fall of Troy: Tolkien and Book II of the Aeneid". Mythlore. Retrieved 2 April 2017. ^ Carpenter, Humphrey, editor, The Letters of J.R.R. Tolkien, George Allen and Unwin, 1981, ISBN 0-395-31555-7, Letter 163, "...the first real story of this imaginary world almost fully formed as it now appears was written in prose during sick-leave at the end of 1916: The Fall of Gondolin". ^ Tolkien, J.R.R. The Book of Lost Tales, Part II. p. 147. ^ Bruce, Alexander M. (2012). "The Fall of Gondolin and the Fall of Troy: Tolkien and Book II of the Aeneid". Mythlore. 30 (3–4). ^ J.R.R. Tolkien. "The Book of Lost Tales, part II", chapter The Fall of Gondolin, p. 158. ^ These Elvish names come from a text written by Tolkien: "The Official Name List", and published in Parma Eldalamberon nº 13, pp. 100–105. ^ a b J.R.R. Tolkien. "The Book of Lost Tales, part II", chapter The Fall of Gondolin, p. 172. ^ a b c J.R.R. Tolkien. "The Book of Lost Tales, part II", chapter The Fall of Gondolin, p. 174. ^ a b c d e f J.R.R. Tolkien. "The Book of Lost Tales, part II", chapter The Fall of Gondolin, p. 173.